Conkling biographer David M. Jordan was also deprecatory: “Fenton was a strange mixture of serious deficiencies and useful abilities. Men differed about him, to say the least. Consider these two statements, both by Republicans of similar political hue, both considered to be men of good will. Chauncey M. Depew of the New York Central Railroad: ‘He had every quality for political leadership, was a shrewd judge of character, and rarely made mistakes in the selection of his lieutenants.’ President Andrew D. White of Cornell: ‘There stood Fenton, marking the lowest point of the choice of State executive ever reached in our Commonwealth by the Republican party. '”3 Fenton was only the fourth Republican to run for Governor of New York and only the third to occupy the position so there wasn’t much basis for comparison. Fenton’s personality proved a useful asset in negotiating political problems with Mr. Lincoln. “My relations with President Lincoln were cordial. 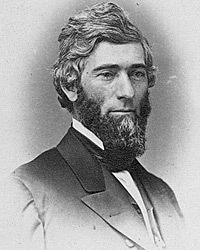 I was a member of the House of Representatives when he entered upon the duties of President and remained in the House until December, 1864, when I resigned my seat for the office of Governor of New York,” wrote Fenton in a memoir of his relations with Mr. Lincoln.8 Fenton, a strong supporter of President Lincoln’s war policies, served in House (1857-64) during the Civil War and in the Senate (1869-75) after the Civil War. His political career came into conflict with those of Roscoe Conkling and Edwin D. Morgan, and he failed to win the Republican nomination for Vice President in 1868. 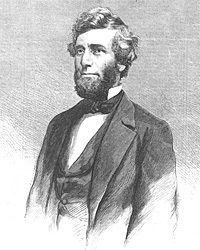 Although Fenton controlled the New York Republican Party during his gubernatorial terms, he lost that control in 1870 to fellow Senator Conkling. “On the 22d day of August, I received a telegram from Mr. John G. Nicolay, Private Secretary, saying that the President desired to see me. I arrived in Washington next day. The President, speaking to me said, in language as nearly as I can remember: ‘You are to be nominated by our folks for Governor of your State. Seymour of course will be the Democratic nominee. You will have a hard fight. I am very desirous that you should win the battle. New York should be on our side by honest possession. There is some trouble among our folks over there, which we must try and manage. Or rather, there is one man who may give us trouble, because of his indifference, if in no other way. He has great influence, and his feelings may be reflected in many of his friends. We must have his counsel and cooperation if possible. This, in one sense, is more important to you than to me, I think, for I should rather expect to get on without New York, but you can’t. 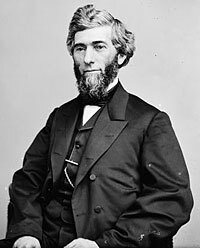 But in a larger sense than what is merely personal to myself, I am anxious for New York, and we must put our heads together and see if the matter can’t be fixed.”13 Fenton had not yet been nominated. He had been considered as a Republican candidate for governor in 1862, but the nomination had instead gone to a fellow Upstate radical, James S. Wadsworth. 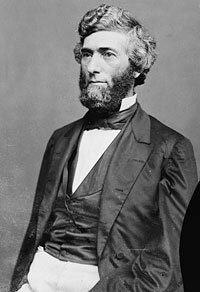 The next day, Nicolay again wrote President Lincoln: “Mr Fenton arrived here this morning and had a conversation with Weed, in which he urged upon Weed his reasons in detail against any changes in the Custom House at this time. Mr. Weed heard him through, admitted there was much force in what he said; but was not convinced. 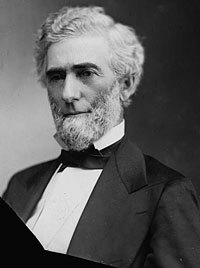 In a conversation with me afterwards, Mr. Weed repeated what he said to me yesterday, that changes were absolutely necessary and would be productive of much good.”17 The changes that were made to placate Weed and unify the party for the benefit of Fenton and President Lincoln — even thought the persons nominated were not Fenton’s political allies. On December 1, 1864, after having sent over 156,000 soldiers and sailors into the army and navy during the year, the state over which a so-called ‘Copperhead’ governor had presided since January 1, 1863, had an excess on credits with the federal government of 5,301 men, according to the report of the Republican who followed him in office. On December 19, 18164, Lincoln called for 300,000 troops, and about January 7, 1865, it was learned that the quota of New York would be 46,861. 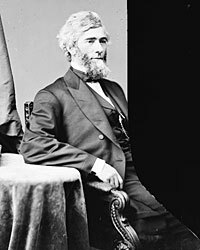 As soon as he had looked over the list of the men required of the thirty-one congressional districts Fenton found the assignments so unequal that he sent two of his aides to Washington to protest. One of these, Colonel George W. Palmer, left with Fry a careful explanation of the governor’s plan for the complicated business of crediting one and three-year enlistments properly to the several districts. Eventually, Fenton got the State’s quota reduced by 9,000 men. In the meantime, Fenton urged the postponement of the draft’s enforcement: “Do not press the draft. Think postponement three 3 or four 4 weeks would enable us to fill the quota. Give all the time that can possibly be allowed without detriment to the public service”.22 New York filled 34,000 of its quota with volunteers and 3,300 with conscripts. Glyndon Van Deusen, Thurlow Weed: Wizard of the Lobby, p. 311. May D. Russell Young, editor, Men and Memories: Personal Reminiscences by John Russell Young, p. 215. 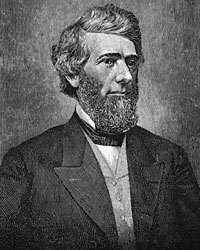 David M. Jordan, Roscoe Conkling of New York: Voice of the Senate, p. 96. David M. Jordan, Roscoe Conkling of New York: Voice of the Senate, p. 97. Stewart Mitchell, Horatio Seymour of New York, p. 376. Helen Grace McMahon, Reuben Eaton Fenton, p. 2. Allen Thorndike Rice, editor, Reminiscences of Abraham Lincoln by Distinguished Men of His Time, p. 67 (Reuben E. Fenton). Allen Thorndike Rice, editor, Reminiscences of Abraham Lincoln by Distinguished Men of His Time, p. 74-75 (Reuben E. Fenton). Helen Grace McMahon, Reuben Eaton Fenton, p. 63-64. Helen Grace McMahon, Reuben Eaton Fenton, p. 67. James A. Rawley, Edwin D. Morgan, 1811-1883: Merchant in Politics, p. 200 (Letter from Edwin M. Morgan to Thurlow Weed, May 2, 1864). Allen Thorndike Rice, editor, Reminiscences of Abraham Lincoln by Distinguished Men of His Time, p. 68-69 (Reuben E. Fenton). Allen Thorndike Rice, editor, Reminiscences of Abraham Lincoln by Distinguished Men of His Time, p. 69 (Reuben E. Fenton). Allen Thorndike Rice, editor, Reminiscences of Abraham Lincoln by Distinguished Men of His Time, p. 69-70 (Reuben E. Fenton). Stewart Mitchell, Horatio Seymour of New York, p. 318-319. Abraham Lincoln Papers at the Library of Congress. Transcribed and Annotated by the Lincoln Studies Center, Knox College. Galesburg, Illinois. (Letter from Reuben E. Fenton to Abraham Lincoln, January 26, 1865). Allen Thorndike Rice, editor, Reminiscences of Abraham Lincoln by Distinguished Men of His Time, p. 71-72 (Reuben E. Fenton). Abraham Lincoln Papers at the Library of Congress. Transcribed and Annotated by the Lincoln Studies Center, Knox College. Galesburg, Illinois. (Letter from Reuben E. Fenton to Abraham Lincoln, February 13, 1865). Allen Thorndike Rice, editor, Reminiscences of Abraham Lincoln by Distinguished Men of His Time, p. 70-71 (Reuben E. Fenton). James M. Trietsch, The Printer and the Prince, p. 278-279.